Although the Raspberry Pi has built-in analog audio output, the interest here is in digital audio output in particular I2S output signals for direct connection to digital to analog converters. I explored a bit the digital audio capabilities of the Raspberry Pi a while ago [link]. Here is an update with more accurate information. PCM_DIN – serial data input. PCM_DOUT – serial data output. In addition, for more advanced configurations, the device can be configured as master or slave: “the direction of the PCM_CLK and PCM_FS signals can be individually selected, allowing the interface to act as a master or slave device”. In normal operation, it is configured as a master device. The audio frequencies (the PCM _MCLK) are supposedly generated by the use of a discrete 0n-board 19.2 MHz crystal. Unlike the BeagleBone Black, where there are facilities (pins) to feed an external master clock. 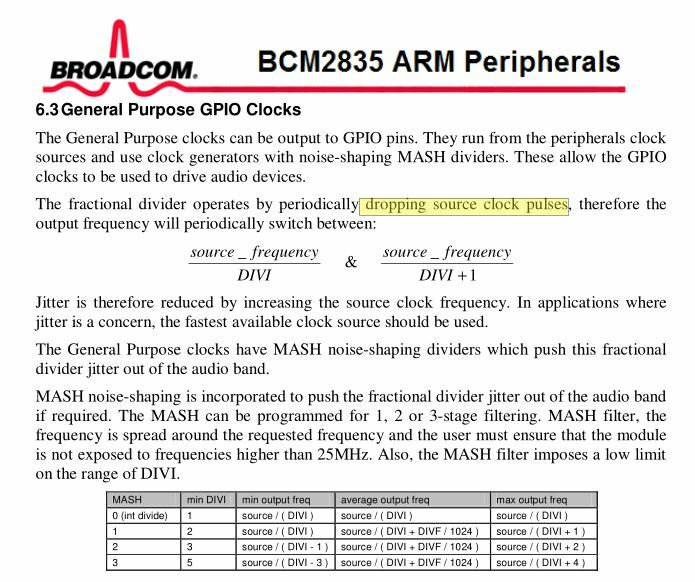 The Datasheet indicates that the clocks are generated by “noise-shaping MASH dividers” which are fractional dividers. It also says that “The fractional dividers operates by periodically dropping source clock pulses”. I believe this post has an example on how this is actually implemented [link]. The way that a 3.25x clock divider is implemented is by dividing by 3x for some periods and 4x for other periods, with the average being 3.25x. In this case the repeating pattern will be (3, 3, 3, 4). That is shown in the following scope capture. Note that the first three periods are divided by 3 and then the next is divided by 4. The way this is implemented in the device is to divide by the smaller divider and then extend the high pulse width by one clock cycle periodically. Well, aiming at 44.1KHz sample rate frequency and getting a frequency variation from 42.9 KHz to 50KHz, this can’t really work for digital audio. Clearly there has to be a better way to generate these clock frequencies. There it is explained that in order to get good clocks, one has to use integer division but with a 19.2 MHz clock, it is impossible to arrive at 32fs or 64fs bitclocks (e.g. 64x48KHz=3.072 MHz). Therefore other internal clocks must be used. We notice that integer division of the external 19.2 MHz clock only works for 48KHz and 96 KHz and for DACs that can operate at 40fs (80fs if we want to pass 32×2 bits per frame). The current version of the code is using 50fs and 100fs which also works. The fact that no clean clocks can be generated in the digital audio frequency range, tells us that this oscillator was not really meant to be used for digital audio. 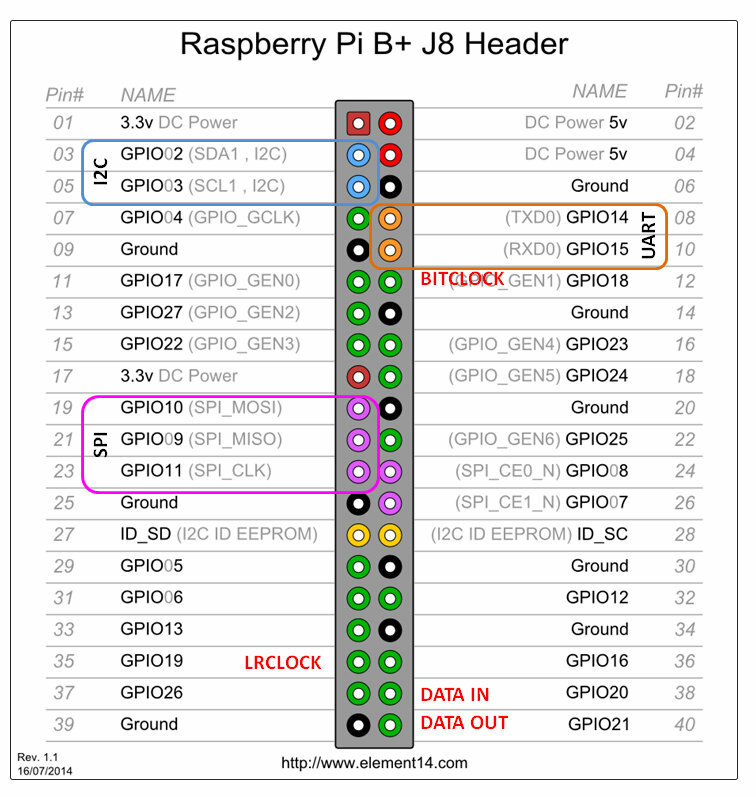 Now why did the designers of RPi use a 19.2 MHz clock? I have searched extensively and cannot find a “reason” for the 19.2 MHz frequency. If it were digital audio, a more logical selection would have been 24.576 MHz in order to cleanly support 64fs 48KHz sample rate (like the BeagleBone Black). A better reason is to use this clock for the on-board PWM audio. One can easily generate a 48KHz carrier frequency (19.2MHz/40) and a resolution of 16 bit would require a frequency of approx 64 KHz (19.2MHz/30). In actually, it has been reported that the resolution is in the neighborhood of 11 bit or 2048 levels which can be obtained by dividing 19.2MHz by a factor of 9375. A better solution is to configure RPi as a slave device and the DAC as a master device. 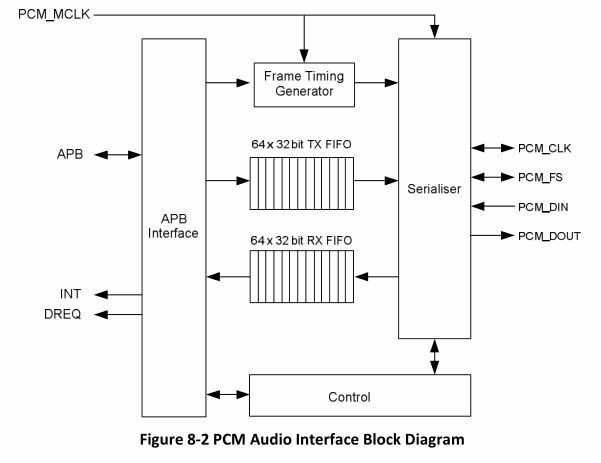 Here is what is required to set the DAC in Master Mode, say for example the PCM5122. RPi detects the sample rate of the clicked-to-play track. RPi has a way to indicate the sample rate (for example using GPIO pins). Microcontroller programs the appropriate frequency by generating an appropriate master frequency from the PLL and setting the appropriate divider to generate the bitclock. Timing of the different events. For example, wait until the microcontroller programs the DAC to the appropriate clock frequency before staring the data stream (DMA) in the RPi. Selection of external clock. For example use a single frequency clock, say a multiple of 44.1KHz in order to take advantage of integer divider only when dealing with frequencies multiple fo 44.1KHz. The current method of generating the clocks for digital audio in the RPi are far from perfect. The best clocks are obtained by integer division of the external clock and works for 48K and 96K sample rates and only if the DAC can accept 40fs or 80fs. For anything else, the clocks are derived from the 500MHz PLL through fractional division as explained above. It has been reported that the 500MHz clock itself is derived from the 19.2MHz external clock through a clock multiplier. 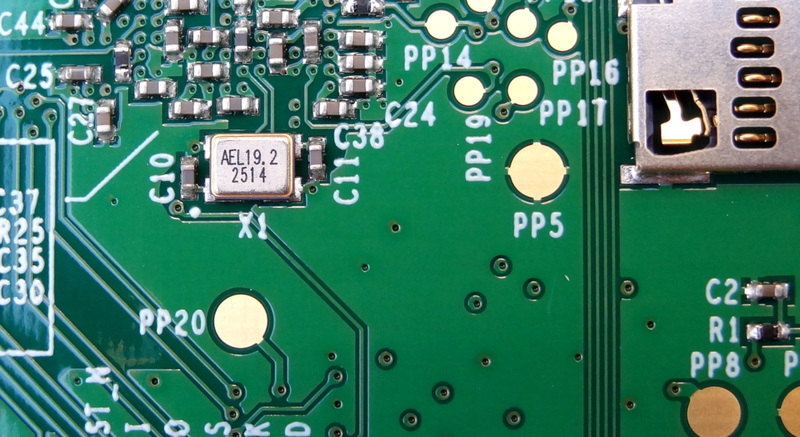 However imperfect as these clocks might be, there are a good number of DAC boards that have been developed and reported to work well with the RP1. As these products are being developed by audio fanatics, we can expect continuous improvements and enhanced approaches to better clock generation such as external reclocking and slave configurations. Can you comment on RPiB+, with the added HiFiBerry Digi board? I am using that to feed the SPDIF input of a DAC. The idea was to avoid USB DAC’s entirely… Or am I still better off with BBB? 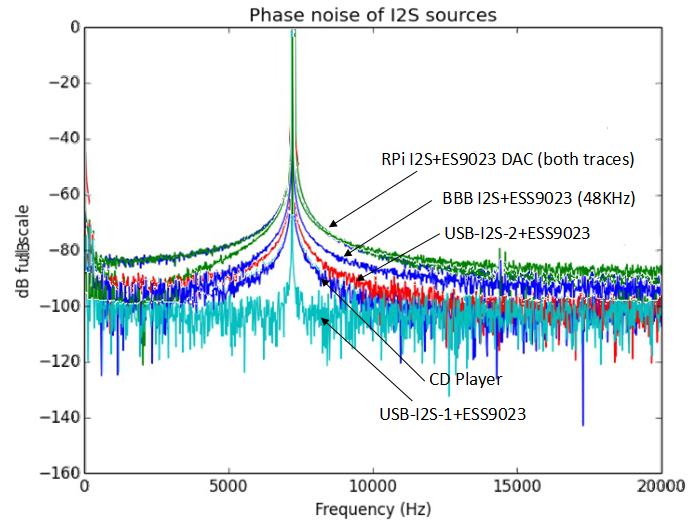 BBB will only work with 48KHz sample rate (and multiples). You will need to wait for the clock boards from TwispedPear Audio in order to support 44.1KHz sample rate. The Rpi can support 44.1KHz sample rate and the plug-in DAC boards that are available work well with the Rpi. Although the concept of a barebones “PC” feeding a DAC is appealing, I much prefer a computer with a USB interface if listening to music is a priority or a CD player for that matter (especially you can buy used CDs for $1-$5). I think the upcoming clocks boards for BBB, especially the reclocking board will allow the BBB to generate good quality I2S signals. The RPi in its current implementation cannot accept external clocks. Hope you don’t mind a noob question. It it better to use a Digi + board or I2S input ? 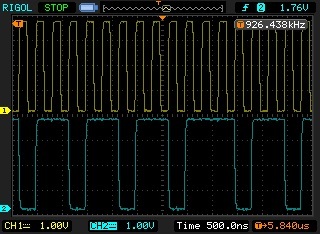 Can the RPi supply a master clock linked to the sampling frequency ? You can try any DAC that does not require a master clock input. The ones specially made to fit on top of the board are not bad and much easier to configure. 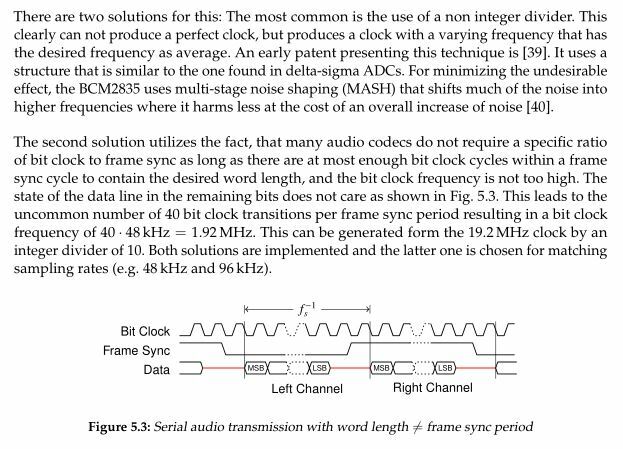 Regarding the AKM, I don’t remember exactly, but according to the datasheet, it needs a master clock input. You can try the master clock from the RPi, but it is not of highest quality. Please checkout the HifiBerry DAC+ Pro. That one slaves the PI with onboard quality clocks! The 44.1/48x clocks are selected via GPIO. Your very good writeup might need a little update if I’m not mistaken. I wasn’t aware the PI has external pins where you can feed a clock to the audio subsystem. Can you point me to it? Last I check only the Blackberry Black has a pin where an external clock can be used in the audio subsystem. You can’t feed the Pi whith a masterclock, but you can feed it with a bitclock. The dac chip on the Hifiberry DAC+ Pro is dividing the bitclock from the on-dac-board masterclocks and is sending it to the RPi. I’m doing the same with a Twisted Pear Cronus (+Hermes-amanero), but only with a fixed sample frequency (352.4 kHz) where bitclock is 22.5792MHz, so software upsampling before playing audio. I plan to make an external board (and dedicated linux driver) selecting and dividing the masterclock to the right bitclock, to avoid upsampling. How would fifo based reclocking in Soekris Dam affect all you state above?